Mulchandani R, Massebo F, Bocho F, Jeffries CL, Walker T, Messenger LA. A community-level investigation following a yellow fever virus outbreak in South Omo Zone, South-West Ethiopia. PeerJ. 2019;7. doi: 10.7717/peerj.6466. Despite the availability of a highly effective vaccine, yellow fever virus (YFV) remains an important public health problem across Africa and South America due to its high case-fatality rate. This study investigated the historical epidemiology and contemporary entomological and social determinants of a YFV outbreak in South Omo Zone (SOZ), Ethiopia. A YFV outbreak occurred in SOZ, Ethiopia in 2012–2014. Historical epidemiological data were retrieved from the SOZ Health Department and analyzed. Entomological sampling was undertaken in 2017, including mosquito species identification and molecular screening for arboviruses to understand mosquito habitat distribution, and finally current knowledge, attitudes and preventative practices within the affected communities were assessed. From October 2012 to March 2014, 165 suspected cases and 62 deaths were reported, principally in rural areas of South Ari region (83.6%). The majority of patients were 15–44 years old (75.8%) and most case deaths were males (76%). Between June and August 2017, 688 containers were sampled across 180 households to identify key breeding sites for Aedesmosquitoes. Ensete ventricosum (“false banana”) and clay pots outside the home were the most productive natural and artificial breeding sites, respectively. Entomological risk indices classified most sites as “high risk” for future outbreaks under current World Health Organization criteria. Adult mosquitoes in houses were identified as members of the Aedes simpsonicomplex but no YFV or other arboviruses were detected by PCR. The majority of community members had heard of YFV, however few activities were undertaken to actively reduce mosquito breeding sites. Study results highlight the potential role vector control could play in mitigating local disease transmission and emphasize the urgent need to strengthen disease surveillance systems and in-country laboratory capacity to facilitate more rapid responses to future YFV outbreaks. 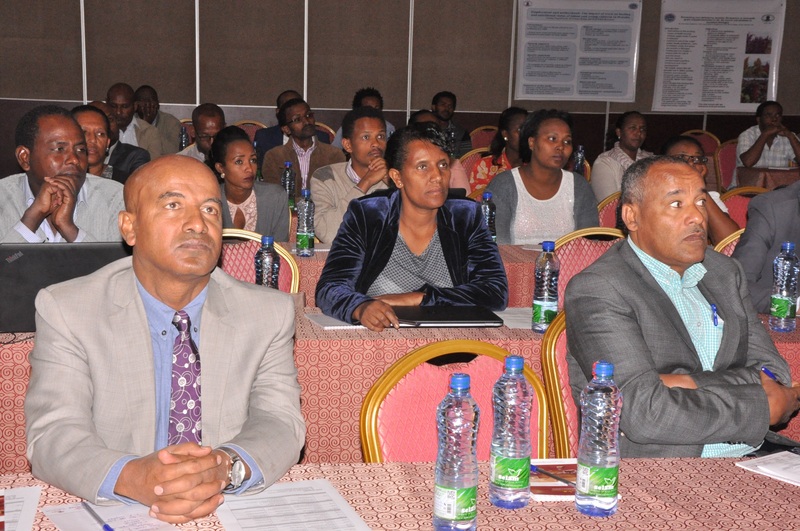 We have recently updated the web page for the South Ethiopia Network of Universities in Public Health (SENUPH); please see https://senuph.w.uib.no . The website includes information about the program, and also about the research work done by each of the PhD students. 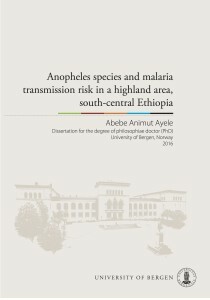 Kenea O, Balkew M, Tekie H, Gebre-Michael T, Deressa W, Loha E, Lindtjørn B, Overgaard HJ: Human-biting activities of Anopheles species in south-central Ethiopia. Parasites & vectors 2016, 9(1):1-12. Background Indoor residual spraying (IRS) and long-lasting insecticidal nets (LLINs) are the key malaria vector control interventions in Ethiopia. The success of these interventions rely on their efficacy to repel or kill indoor feeding and resting mosquitoes. This study was undertaken to monitor human-biting patterns of Anopheles species in south-central Ethiopia. The overall mean anopheline density was 3.3 times higher outdoors than indoors (65.3 vs19.9/person/night, IRR: 3.3, 95 % CI: 1.1–5.1, P = 0.001). The mean density of An. zeimanni, An. pharoensis and An. funestus (s.l.) collected outdoors was significantly higher than indoors for each species (P < 0.05). However, the mean An. arabiensis density outdoors was similar to that indoors (11.8 vs 9.4/person/night, IRR: 1.3, 95 % CI: 0.8–1.9, P = 0.335). The mean hourly human-biting density of An. arabiensis was greater outdoors than indoors and peaked between 21:00 and 22:00 h. However, An. arabiensis parous population showed high indoor man biting activities during bedtimes (22:00 to 05:00 h) when the local people were indoor and potentially protected by IRS and LLINs. All mosquito samples tested for CSP antigen were found negative to malaria parasites. Conclusions Results show much greater mosquito human-biting activities occurring outdoors than indoors and during early parts of the night, implying higher outdoor malaria transmission potential in the area. However, high bedtime (22:00 to 05:00 h) indoor biting activities of parous An. arabiensissuggest high potential intervention impact of IRS and LLINs on indoor malaria transmission. The Sustainable Development Goals are to end the TB epidemic by reducing the incidence of TB by 90 % and by reducing mortality by 95% by 2035 from what was in 2015. Globally, access to TB diagnostic and treatment facilities (DOTS) has improved, and millions of TB cases have been notified and treated, which has resulted in many lives being saved. 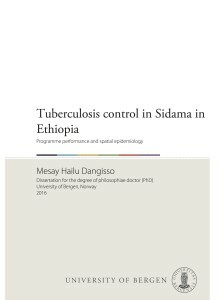 In recent years in Ethiopia, TB control services have been substantially expanded and decentralized, which has improved access to TB care. Assessing trends in TB programme performance (case notification and treatment outcomes), as well as the spatial distribution and variations of the disease, could help in understanding the differentials in accessibility to TB control services, the distribution of disease burden and help in understanding the effectiveness of TB control programmes. We assessed the distribution of- and accessibility to TB control facilities and trends in TB control programme performance in both urban and rural settings, by age category and by gender, and assessed the case notification rates of childhood TB over 10 years. We also assessed trends of the treatment outcomes of TB cases in order to identify high-risk groups for adverse treatment outcomes. Lastly, we explored spatial distribution and spatio-temporal clustering of the disease over 10 years to identify areas with the highest TB case notifications, and to identify the spatial variations in disease occurrence. Over 10 years, the accessibility to- and coverage of TB control facilities has improved. Thus, TB control service coverage increased by 36%, and the proportion of locations within 10 km of the nearest TB diagnostic facility also increased. However, we noted variations in physical accessibility between areas in the study area. The mean distance from the nearest smear microscopy unit was 7.6 km in 2003 and declined to 3.2 km in 2012. The substantial expansion of primary health-care services, including TB control facilities and community-based intervention, has contributed to an increase in TB CNRs and treatment outcomes. From this finding, we suggest that a concerted effort be made to improve the accessibility to TB control facilities in areas with low case notification and poor accessibility. An analysis of the trends of TB case notification and treatment outcomes in different settings based on the correct address, by age category and gender, and place of residence, could help understand the performance of TB control programmes and the epidemiology of TB within a community. We found that the CNRs for all forms of- and smear-positive TB increased steadily between 2003 and 2012. The CNR of smear-positive TB in the 45-year and above age groups rose by nearly fourfold. The disparity between men and women in CNR declined from 16 per 100,000 people in 2003 to eight per 100,000 people in 2012, with the male to female ratio also declining from 1.3:1 to 1.1:1. The increase in CNRs could be attributed to improved access to TB care and community-based interventions. Over a decade, treatment success increased, whereas mortality and lost-to-follow-up declined. However, more deaths occurred among smear-negative TB cases, in children and among older patients. Targeted interventions are needed to address high-risk groups for adverse treatment outcomes. The burden of childhood TB is one of the indicators used for assessing the ongoing transmission of the disease within a community. Assessing the case notification and treatment outcome of childhood TB could provide essential evidence to help understand the effectiveness of TB control programmes and the disease burden. Thus, we assessed childhood TB case notification and treatment outcomes over a decade. The mean CNRs for new cases of TB of all forms were 30 per 100,000 children, and no decline was observed in childhood TB cases over a 10-year study period. A community-based active case-finding intervention increased TB case notification in adults and in older children (10-14-year-olds); however, the case notification did not increase among younger children (less than five-years old). This could be explained by inadequate diagnostic facilities for childhood TB despite the community-based intervention, which focuses on symptomatic screening, followed by sputum-smear microscopy and the substantial expansion of TB control services. Better diagnostic facilities and interventions are required to increase case detection, and to improve treatment outcome among younger children. The burden of TB varies between- and within countries because of differentials in health service performance and the varying distribution of risk factors that increase the transmission of- and susceptibility to the disease. An analysis of the disease burden in coarser geographic or administrative units could hide the burden of the disease at lower administrative units. Therefore, we assessed the distribution of the disease in different geographic settings in the study area, and looked for the pattern of the disease transmission over years, as well as for evidence of spatio- temporal clustering. We found spatial variations in both the disease distribution and spatial and space-time clustering of the disease in the central, northern and northwestern areas of the study area. This could be explained by sustained transmission, disproportionate distribution of risk factors, varying access to TB care and varying TB programme performance, all of which require targeted interventions. In conclusion, in a population with a high prevalence of tuberculosis, we show that access to tuberculosis diagnostic and treatment facilities, in addition to the performance of TB control programmes, improved from 2003 to 2012. However, we identified areas with poor accessibility to diagnostic and treatment facilities. The low and constant case notification rate in childhood TB is an area of concern, and may indicate an underdiagnosis of childhood tuberculosis. Moreover, the distribution of tuberculosis has changed over time, and in different areas, thereby suggesting a high transmission or variable access to diagnosis and treatment. As a result, the variations in case notification rates, and in accessibility to tuberculosis control services represent challenges on how to improve the organization and performance of TB control. To download the thesis please clic here. Joint-PhDs are doctorates, which are done at two degree-awarding institutions. This doctorate means that you are fully registered in two universities, having to comply with admission requirements, and assessment regulations at both institutions, and it will result in one jointly awarded PhD (one diploma with the two university logos). 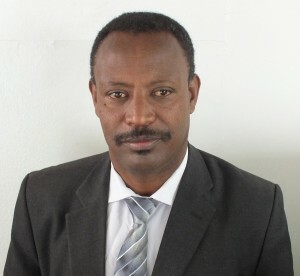 Recently, Hawassa University and the University of Bergen agreed on such a joint PhD degree. This programme is funded by The South Ethiopia Network of Universities in Public Health (SENUPH), and nine PhD students have been registered at the home institution which in this case is Hawassa University. The currently available financial support is for staff at Hawassa, Dilla and Wolaita Sodo universities. We plan to admit seven more students (four women and three men) in September 2016. You can get more information about the admission requirements and about topics that this programme will prioritise by writing to Dr Eskindir Loha or to Professor Bernt Lindtjørn. The structure of the joint PhD programme can be downloaded here. In October, the PhD programme started at Hawassa University. 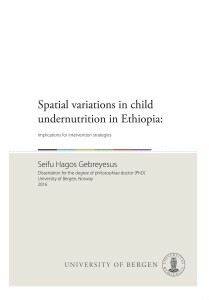 This is a joint programme between Hawassa University and the University of Bergen. Can an intervention to reduce the oral and physical abuse by health workers on women during labour improve the health for the mother and child? Does intimate partner violence and depression during pregnancy adversely affect maternal health during delivery, and the health of the newborn? To describe the vulnerability to food shortages by examining food insecurity, food intake and nutritional status over one year in Wolaita. Is the nutritional transition taking place in Wolaita increasing the occurrence of non-communicable diseases such as hypertension and diabetes? Can better use of the iron-rich amaranth plant reduce the occurrence of iron eficiency anaemia? 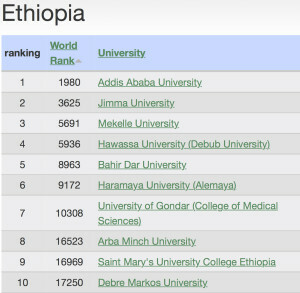 During the last decade there has been a great increase in the number of Ethiopian Universities. There are several methods of ranking universities. This is a ranking system with many pitfalls, but it gives an impression about the quality of work done at the institutions. 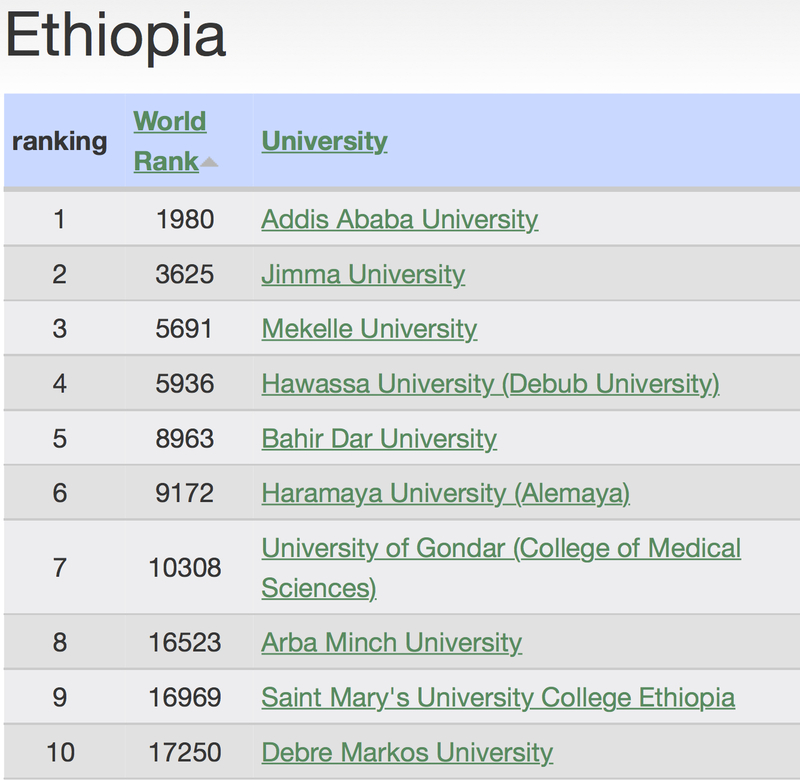 The top 10 ranking Ethiopian Universities are seen from the table.